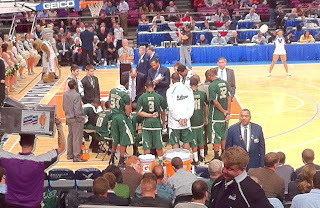 First game of the Big East Tournament at Madison Square Garden and our USF Bulls beat Villanova 70-69. Pretty cool considering we were underdogs ... overcame a 16 point deficit and became the first team in the history of Big East Tournament play to do so. Tonight we play Cincinnati. Pray for us! Earlier we played at the Apple Store where Debbie got a new phone, brought three poor salespeople to their knees as they tried to explain how to use itunes and only took 3 hours this time to finish complaining about her first iphone. By the way... she cursed the phone 4 times today ... and it's Ash Wednesday! Oh ... 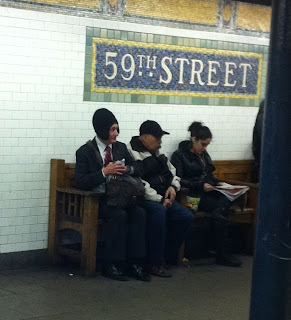 I got this great shot when we rode the subway and ran into the guy who starred in the Coneheads with Dan Ackroyd. Did the Conehead smoke a whole pack of cigarettes at once, too? @Chrissy ... Yes ... he consumed massive quantities.